The All-Around IWB Concealment Holster gives you the flexibility to conceal your gun anywhere around your waist. With the All-Around IWB Concealment Holster, you position your gun just the way you like it, straight up or in the FBI style grip forward tilt. This allows you to place your gun anywhere around your waist. The All-Around IWB Concealment Holster keeps your gun close to your body for maximum concealment, making it almost “disappear”. 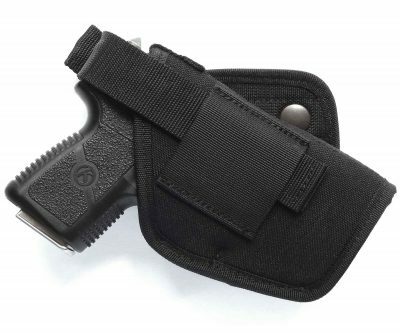 This is a quality IWB concealment holster designed for no-nonsense, practical everyday use. It is a versatile and comfortable method of deep concealment carry. MULTI-POSITION: Its design lets you position your gun straight up or in the FBI style grip forward tilt, so it is great for appendix carry, strong-side (2, 3, and 4 o’clock) and crossdraw (11 o’clock) carry. FITS: The All-Around IWB Concealment Holster accommodates both revolvers and autos making it ideal if you have several carry guns. COMFORT: The sweat guard provides a very comfortable extended, all-day concealed carry, even with large guns. It prevents your gun from rubbing against your skin and also protects the gun from perspiration. CONCEALMENT: The flat, low profile of this design provides great concealment with a full combat grip. IMMEDIATE ACCESS: You have immediate access to your gun. FAST DRAW: Open top design offers a smooth, fast draw. QUALITY PRODUCT: Made of waterproof, high-tech closed-cell foam padding for a comfortable carry and to protect your gun from moisture. This foam, with time, will conform to the shape of your gun giving you a custom fit. FINEST MATERIALS: Lined on both sides with rugged Cordura® nylon for durability and a smooth, fast draw. We use only the finest bonded nylon thread and all stress points are double stitched for extra strength and durability. SECURE: Heavy-duty black powder coated spring steel clip keeps holster secured to belt or waistband. Fits up to 1¾” belts. USA: Designed and made in the USA. Notice: The All-Around IWB Concealment Holster is designed for maximum concealment, and is NOT intended for one-handed re-holstering and should not be used for such applications. The Self-Defense Guideline Card! The seven steps you must take to keep you from going to prison if you ever have to use your gun in self-defense. This card reveals, step-by-step, exactly what to do after the confrontation ends and the confusion begins. It contains vital information to protect you! If you carry a gun for protection, you can’t afford to be without this card in your wallet or purse. Now you can get this card absolutely free, just by trying the All-Around IWB Concealment Holster —at no risk to you! Fits most handguns such as Glock 26, 43, Sig Sauer P365, Beretta, Springfield, M&P Shield, Ruger LC9, Taurus, Kahr, Kimber, Kel Tec, Bersa, Walther, S&W, 380, 40 Auto, 38 special, 45 ACP, 9mm and many more. Took some time to adjust to it, but the material molded great and now i am very happy with it. It came stiff and flat, but after about 72 hours it had molded nicely to my Glock 42 W/ laser. Using it now almost everyday to work. 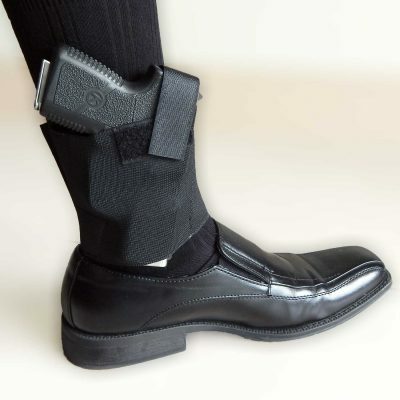 Ankle Concealment Holster. Concealed Carry with Comfort.